A choral project in which everyone’s contribution was equally important, “a victory for all”. 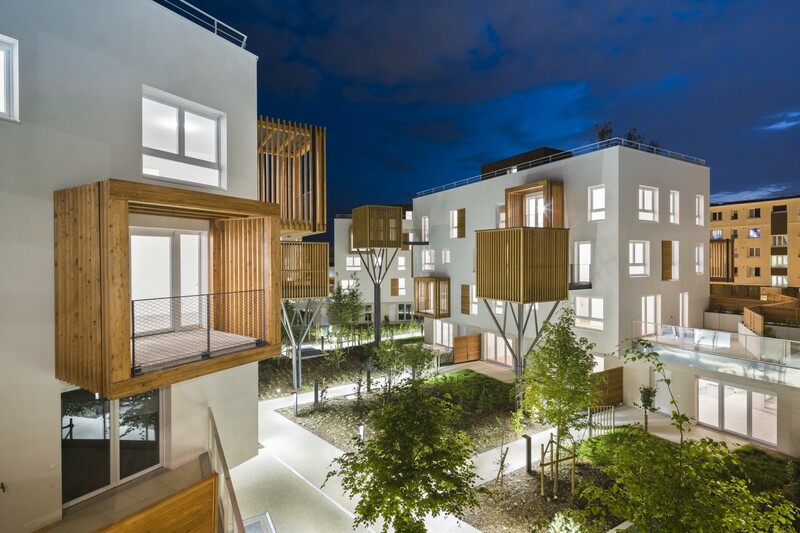 This is how the architects of Brenac & Gonzalez & Associés describe the Romainville housing development, depicted in photographs by Sergio Grazia which give visible form to the sensation of harmony conveyed by the development’s simple, airy, open volumes. 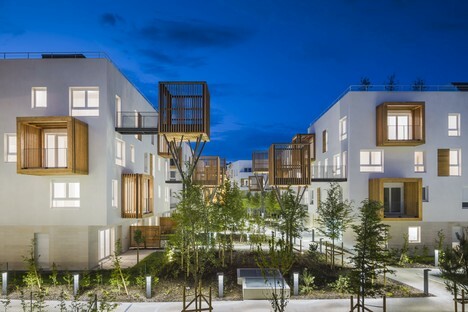 The Romainville housing development is made up of volumes of simple geometric shapes arranged to form an open, airy lot which nonetheless preserves the alignment of the road. The project may in fact be read in two ways. Looking at an aerial view of this part of the city, we can see that despite its fragmentation into several buildings, the architects have composed the volumes to restore overall unity. They succeed in their intent of preserving the alignment of the roads characterising the area. 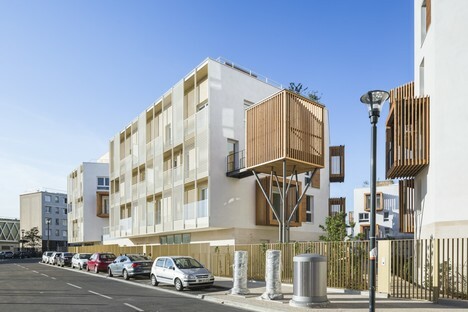 At the same time, thanks to this fragmentation, the architects have created panoramic views of both the interior and the exterior of the lot, achieving the twin goals of obtaining the required residential density while designing quality buildings with a variety of different orientations and points of view. The differences in the volumes are not merely the result of fragmentation of the buildings making up the housing development, but also of the alternation of three different types of building distributed on the basis of the features of their surroundings and the nearby constructions. The first type of building is referred to as a step building for its unusual shape on the side facing the centre of the lot. On the side facing the road it is a linear volume with six levels (ground floor + 5 floors), but on the inside the volume is terraced. The architects created this type of building to achieve a gradual transition and ensure that the building is constructed on a human scale for its inhabitants. The other residential units are contained in buildings combining blocks and townhouses. The block buildings contain most of the apartments in the development, organised with only a few apartments on each floor and a variety of different orientations to ensure proper exposure to sun and ventilation. The ground floor of the building recalls the style of the townhouses, where every unit has its own garden and separate entrance. The architects wanted to give the apartments on the higher levels their own quality outdoor space, too. The outdoor areas are different for each type of home, so that there are apartments with private gardens or rooftop patios with their own private access, and patios and big terraces for apartments on the intermediate levels. For some of the units, the architects have designed external cabins linked by walkways and supported by a metal structure with a central pillar. The 9 square metre cabins have no roofs and recall treehouses. 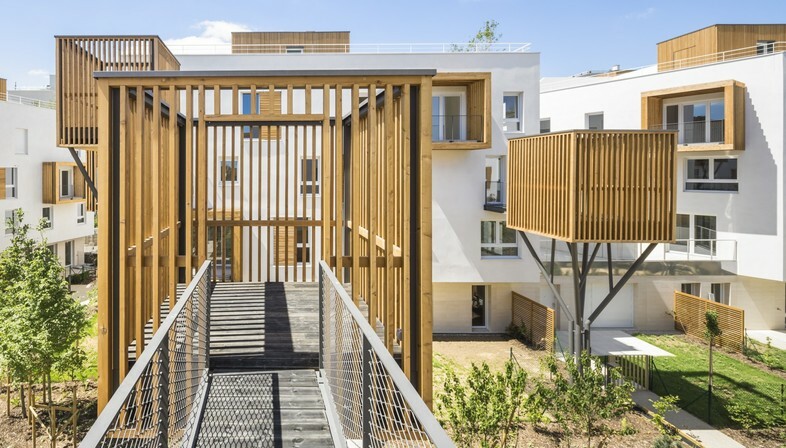 They are bounded by wooden sunbreaks, as are the patios and balconies present on the façades of all the buildings in the housing development, helping to create effects of light and shade. The idea behind these unusual outdoor spaces soon became the distinguishing feature of the Romainville housing development, making it a landmark in this part of the city.